It always gives me a good feeling when local authors do well. It's a sign that, in spite of a lot of bad news locally on the library front, there is clearly a passion for reading and writing amongst the people of Lincolnshire. Margaret Dickinson was in Louth to publicise Welcome Home, a family saga set during the Second World War. The story follows the lives of people in Grimsby, one of the few places in the Lincolnshire area where people were evacuated from rather than to. Its release in 2015 is timed to mark the anniversary of the end of the war 70 years ago. 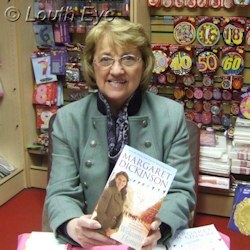 Margaret signed books in Wrights, MSR News, and WHSmith as part of a regional tour for her new novel. Her 2014 novel Fairfield Hall reached number nine in the Sunday Times bestsellers lists for paperback fiction in March 2014. From one bestseller to another. 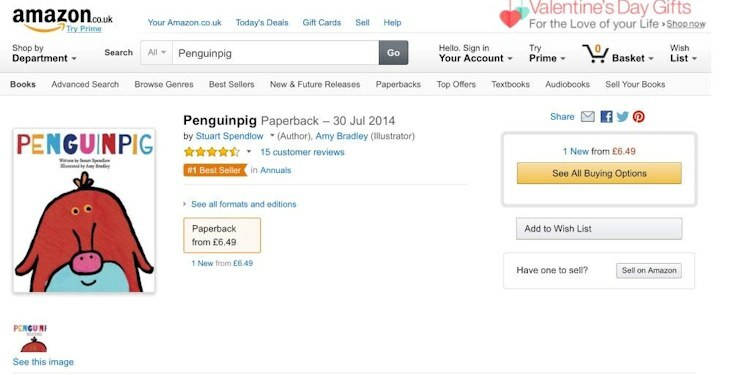 Stuart Spendlow's PenguinPig has been climbing the Amazon charts recently. It hit number 1 in the Annuals category on Amazon. I'm not sure why it's in that category, perhaps a hint that we'll see another in the series next year? Given the book's popularity and cyber-safety message, I hope so. Eamonn Griffin has started a blogging project to map all of the benches in Louth. Actually, he started this in January and I've only just got around to highlighting it, but better late than never. He takes a look at each bench and the local history surrounding it, and it's quite fascinating and nostalgic at the same time. I'll admit, I wasn't convinced that a blog about benches would be all that fascinating. But Eamonn's anecdotes, voice, and historical knowledge really light up the subject matter, and that's the sign of a talented writer. Eamonn Griffin is a lecturer in creative writing, English and media studies at Grimsby Institute, and he's represented by PFD Literary Agency. If the above success stories have given you an appetite to get your stories on the page, there's good news. The 9th of March a new writing group, Write Away, will meet from 11am to 1pm in the Garden Room, Elizabeth Court, on Church Street. It will be an opportunity to hone your craft and meet like-minded writers. I hope that the next time I write a summary of local authors' triumphs there will be new names and more tales of satisfied readers.